Hartford, CT - Everyone in Connecticut seems to catch golf fever when the top players come to town for the Travelers Championship, including kids. Young golfers who are inspired to become the next Jordan Spieth can learn from the best at PGA Junior Golf Camps and Leagues in Hartford. Goodwin Park & Keney Park Golf Courses are two of only four courses in the state offering the official PGA Camp curriculum for children age 6-16. Beginners and advanced players are supported, encouraged and inspired to reach their full potential both on and off the course. This is the third year that these nationally recognized golf camps are available at Goodwin. 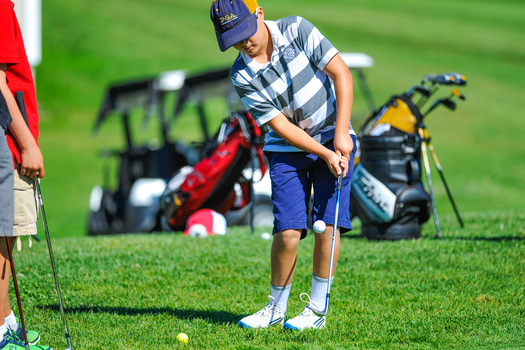 Junior golfers will experience activities that will create a lifetime golfer who understands how to play with proper fundamentals, etiquette, and a desire to improve. The week includes a competitive junior tournament, a graduation ceremony, and parent child golf outing on Friday afternoon. The signature PGA camp curriculum focuses on developing golf skills-full swing, short game, rules and etiquette- while keeping the experience fun and engaging with games and activities. Every Junior golf camp instructor has been trained and tested in all aspects of the game by the PGA of America. Young golfers have their choice of Half Day sessions from 9am-noon for $250 per week, or a Full Day from 9am-4pm for $450 from June 25th to August 3rd. For those golfers who would like to compete, the PGA Junior League will open at Goodwin Park and Keney Park for the first time this summer. Golfers under the age of 16 will get the opportunity to learn from certified PGA and LPGA professionals while playing competitively against teams from other golf courses every Sunday. Ultimately, the program encourages mentorship, builds confidence, and promotes sportsmanship for all of its participants. Junior golfers enrolled in the Junior PGA League will be divided into two groups contingent on age and skill level: Under 14 and Under 16. Participants will receive two high quality jerseys for matches, performance caps and T-shirts, a bag tag, a draw string bag, and access to the PGA Jr. League Merchandise Store. The cost is $275 and registration is open until June 10th. Teams from all over Connecticut are then paired together geographically into divisions of four teams, who play against one another all summer long, with the winners advancing to compete against other programs at the top of the standings. Peter Seaman, PGA Head Professional at Keney, and Mentz will offer their instructional expertise to grow golfers’ love for the game by actively immersing children in the sport from a young age. The introduction of the Junior PGA League is just a small part of the larger initiative taken on by the City of Hartford to rejuvenate its courses with extensive renovations. They are continuously improving equipment, making course repairs, and maintaining practice facilities at both facilities. Goodwin Park and Keney Park offer affordable season passes and convenient locations in Hartford that are accessible to the public. “As the father of three kids I am committed to growing youth golf in Connecticut and coaching to build both skill and character,” said Mentz. Registration for both the 2018 PGA Junior League and PGA Junior Camp is available on the course websites at www.goodwinparkgolfcourse.com or www.keneyparkgolfcourse.com. The Goodwin Park Golf Course dates back to 1906 and is now thriving after $1 million in improvements. The course is home to a nine-hole North Course and an 18-hole South Course, as well as a practice area and driving range. It is located at 1130 Maple Avenue in Hartford. For more information visit www.goodwinparkgolfcourse.com or call 860 -543-8518. The 18-hole Keney Park Golf Club is located at 171 Windsor Ave in Windsor. It was just ranked #2 in CT by GolfWeek Magazine for courses you can play 2018. For more information visit www.keneyparkgolfcourse.com or call 860.543.8618.